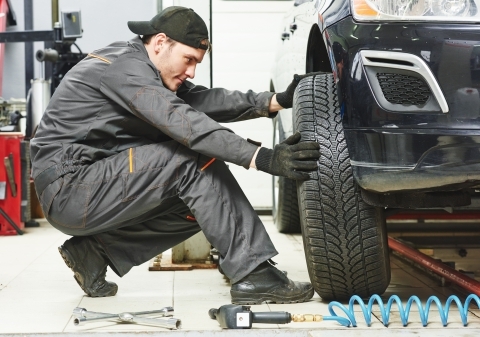 When was the last time you had your car’s brakes checked? We’re guessing it’s been a while. Brakes are an important safety feature; in fact, we think they’re the most crucial safety feature your car can have. There are many different features within a braking system, including the brake pedal, the hydraulic brake fluid, the brake master cylinder, the power brake booster, the drum brakes, the disc brakes and the electronic anti-lock brake sensors. With so many components to your brakes, there are many different warning signs it’s time for a replacement, repair or service. The brake dashboard light is red, signaling a brake system imbalance. The brake pedal feels spongy when engaged, or it is slow to respond. The brakes, when engaged, are giving off a constant squealing or grinding sound. The brake dashboard light is orange, indicated there is a problem within your brake system (usually anti-lock brake systems [ABS]). Is It Time for a Brake Service? If you’ve been ignoring any of the above brake warning signs, it’s time you make an appointment with the leading German automotive technicians in Denver, Avalon Motorsports. With our drive, passion and experience, we know our team can provide you with the utmost brake repair, replacement or service you need. When you need us, we’ll be there for you. We provide each and every customer with high quality pads and shoes. Rest assured that you are in good hands at Avalon Motorsports. Feel free to learn about our other auto repair services. We provide service for Audi®, BMW®, Volkswagen®, Porsche®, and Mini® vehicles.